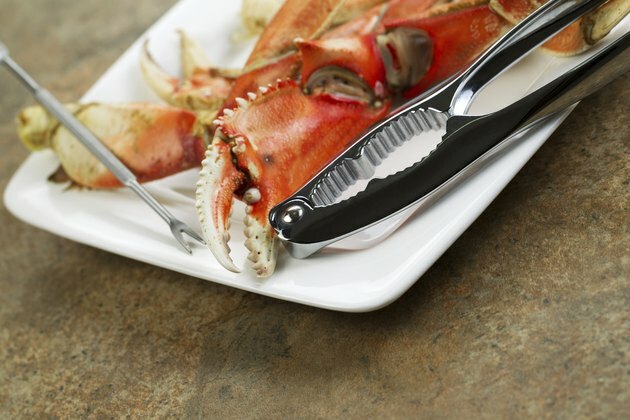 The stone crab, also known as the Florida stone crab, is fished from the North Atlantic Ocean. It differs from other types of crab, as it is not typically harvested whole. The largest claw is cut from the crab and it is released back into the ocean where it can re-grow. Stone crab claws are usually sold frozen after a high-heat cooking to ensure the flesh does not stick to the interior of the shell. The best way to heat frozen stone crab is by boiling it and serving it immediately. Fill a large pot 3/4 full with water. Add 1 tsp. of sea salt for every 6 cups of water. Place the pot of water over high heat and bring it to a boil. Place the frozen stone crab claws into the boiling water. After two minutes, turn off the heat and allow the crab to continue cooking for eight minutes. Remove the cooked stone crab claws from the water and set them onto paper towels to drain and cool for five minutes. As they cool, you can melt a small amount of butter or butter substitute to serve as a dipping sauce. Serve the stone crab while hot with a garnish of lemon wedges. Refrigerate leftover stone crab immediately and consume it within two days. How Many Calories in One Pound of Snow Crab Legs?